Let’s get the most important thing out of the way first: SoLo Energy Bars ($32/box of twelve) taste pretty good. Why’s that the most important thing? Because even if an energy bar is so nutritious that it lets you run marathons and beat up Mike Tyson with energy to spare, you won’t eat it if it tastes like chalk. SoLo energy bars don’t taste like chalk; the two chocolate ones are halfway towards actual chocolate bars, the peanut one is tasty as all hell (like a more substantial peanut butter cup), the lemon one is nice and light . . . and I couldn’t get into the coconut/pineapple one. But hey, four out of five ain’t bad. Okay, now for the main reason to go for a SoLo Energy Bar: they’re low-glycaemic. In fact, they’re the first energy bar to be certified as low glycaemic in Canada. So what’s that? Basically, they won’t give you a blood sugar spike a few hours down the line. Some other key but boring facts: they’re only 200 calories, with 10-13 grams of protein, 3-4 grams of fibre, and 25 grams of carbohydrates. They’re free of gluten, additives, artificial flavours, artificial preservatives, artificial sweeteners, high-fructose corn-syrup, sugar alcohol, trans fats, hydrogenated oils, and GMOs. I’ve been keeping a couple in my laptop bag, just in case I end up working through lunch or something. I also have one after a workout; so far, it’s a good system. Even having them around the house has been solid, since my friends have kids that are apparently allergic to damn near everything in the universe . . . they get the coconut/pineapple bars. 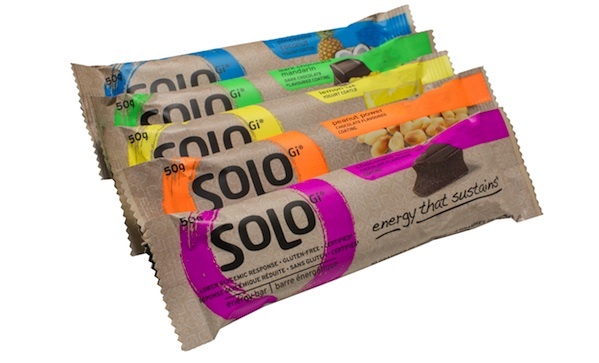 So here’s the bottom line: SoLo Energy Bars taste pretty good and take care of most nutritional requirements you can imagine. I’m pretty happy with ‘em.